Read Mrs. Miller’s diary entries, and recreate the quilt blocks she makes with her young neighbor Ellie. 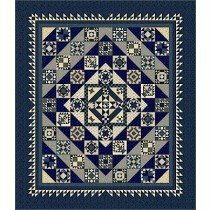 The quilt features several gorgeous Indigo blue prints, and other shades of blue which were popular in the 19th century. Additional light prints make the sampler blocks sparkle! This BOM will begin in February 2019 and run for 13 months. Kits will include Mrs. Miller's Apprentice Pattern and all fabrics needed to complete the top and binding. Sign up fee is $25. If you sign up during our party on January 12, you will get a $20 gift certificate to our shop. If you pay for all 13 months at once, you will get a $50 gift certificate, a 20% off coupon for your future backing, and we will waive the signup fee. The entire kit cost is $299.